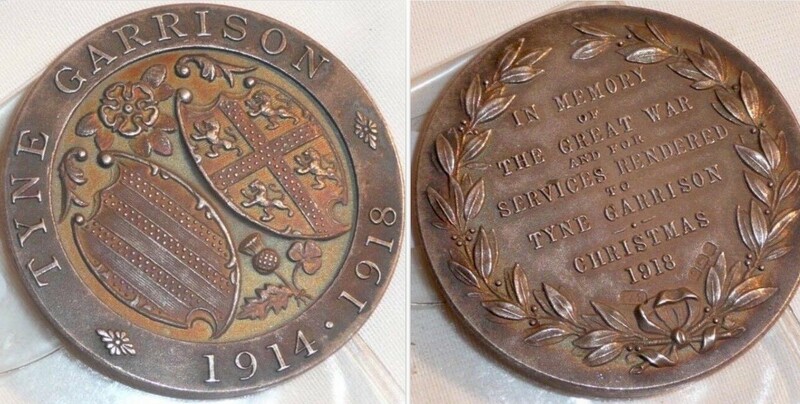 I promised our Archivist, Rachel, at Tyne & Wear Archives that, as soon as I was in a position to do so, I would search for a number of old photographs which School had signed out on temporary loan but for some reason had failed to return. When I learned the Church High Alumnae photographic archive had been returned to Tankerville Terrace from its storage crate at Quicksilver in July, this was the first job on my list. It may be our school archive, but once it was signed over to the care of Tyne & Wear Archives at the Discovery Museum – a branch of The National Archives – in 1985, this is where all catalogued items should always be. Not only are they properly conserved and in very safe hands there, they are also freely accessible to anyone who has a desire to view them. Indeed, this is how gaps in the archival material first came to my attention. 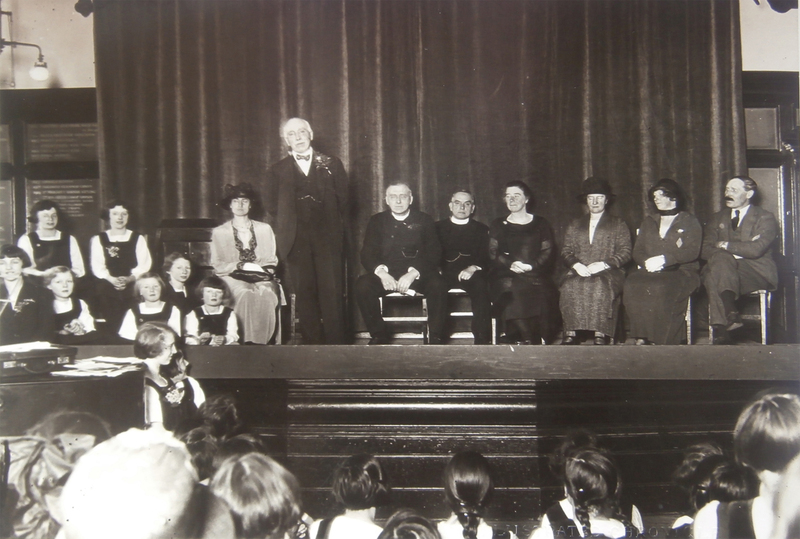 I found myself both disappointed and not a little flummoxed when my search request to look at an early catalogued photograph of ‘Miss Dickinson playing the piano in the school hall for drill’ drew a blank. The early image of Miss Dickinson playing the piano in the Hall for which I searched in vain [Tyne & Wear Archives]. Once the majority of the photographs were located, I made a scan of each image before returning them to a delighted Rachel. Broadly speaking, they were some of the earliest existing photographic records of Newcastle High School at Tankerville Terrace, most likely signed out for a little exhibition to celebrate the School’s 120th Birthday. Aware that, as a girl, Miss Dickinson had moved with the School from Jesmond Road to Tankerville, I found myself looking just that little bit more closely at what appeared to be the very earliest Form photograph, more out of curiosity than in the hope that I might find her younger self looking out at me from the aged image. In turn, this led me to focus this next post on the second half of Miss Dickinson’s memories, written for the Jubilee Book in 1935. Of the four photographs in the batch produced by Elliott & Fry of 55, Baker Street, London, this image (1634/662) stood out The fact it was double-mounted and a yellowish hue suggested it wasn’t taken at the same time as the others. 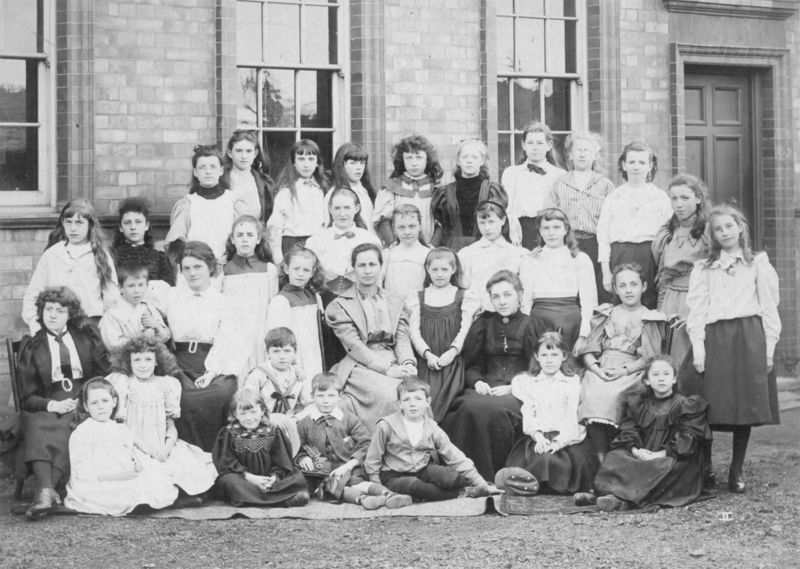 Catalogued only as ‘Staff and younger girls’, the pupils are also grouped beside the side door at the north end of the building, not the front door as the others. A date c 1890 seems likely. 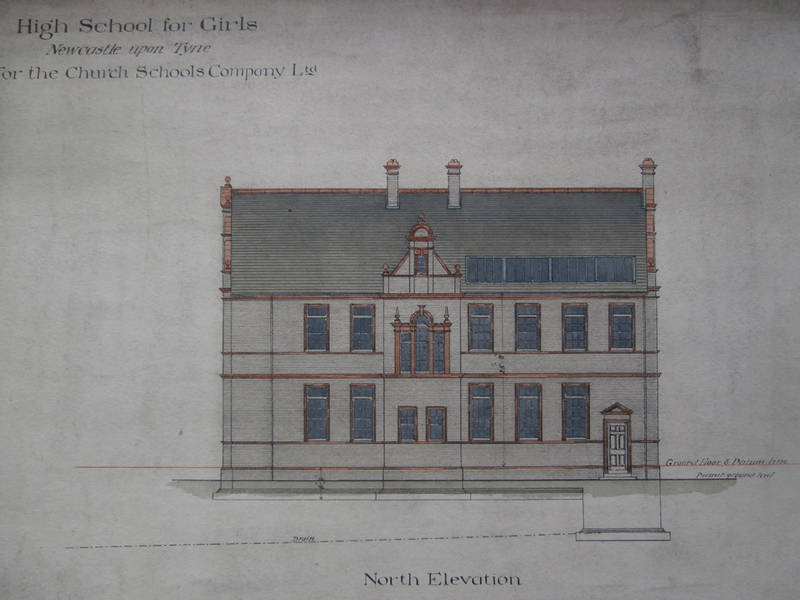 Oliver & Leeson’s 1888 Architect’s drawing for the North Elevation of the new school building on Tankerville Terrace. 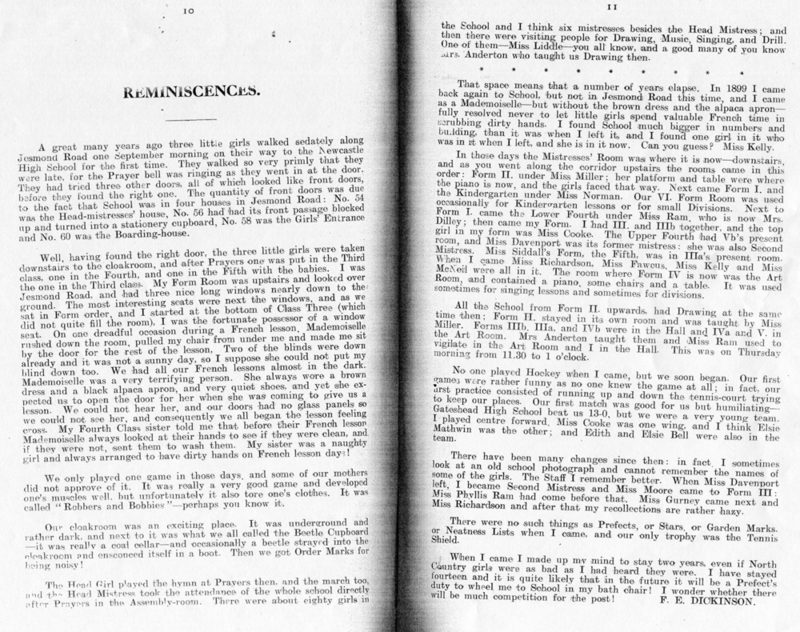 Miss Dickinson first wrote about her long association with the School in an essay entitled ‘Reminiscences’ which was published in the March 1913 edition of the Newcastle High School magazine. It makes fascinating reading and can be read in full on the Heritage website. 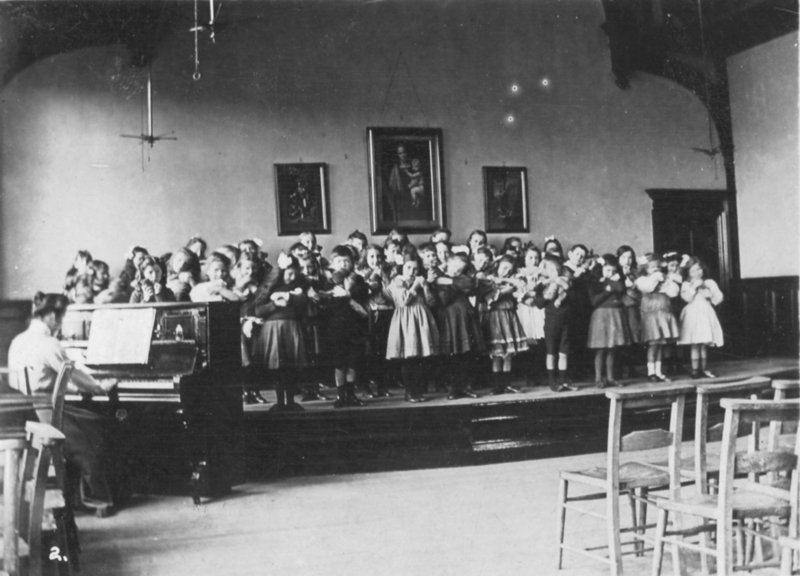 There are numerous differences to the piece she wrote for the Jubilee Book twenty years later, particularly in relation to her time as a pupil at Jesmond Road. In this essay she very helpfully dates her return to Tankerville Terrace as a young teacher as 1899. Facsimile of Miss Dickinson’s 1913 magazine reminiscences. 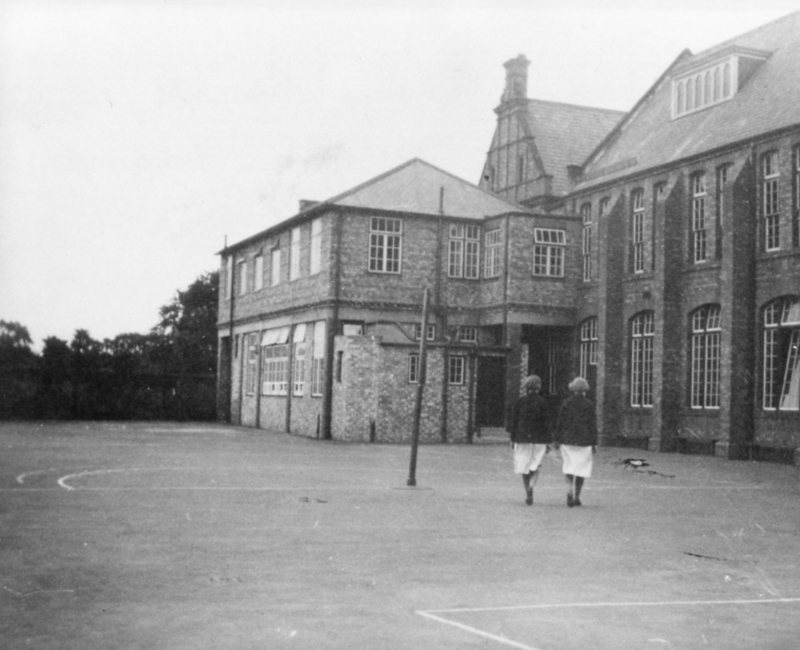 On page 52 of the 1935 Jubilee Book, Miss Dickinson continues the tale: “As I said before, one happy day I came back to my old School as a mistress. The gymnasium, brass locks, glass panels, Wilson’s boy and a green cupboard that I never could draw properly were still there but things had changed a good deal. 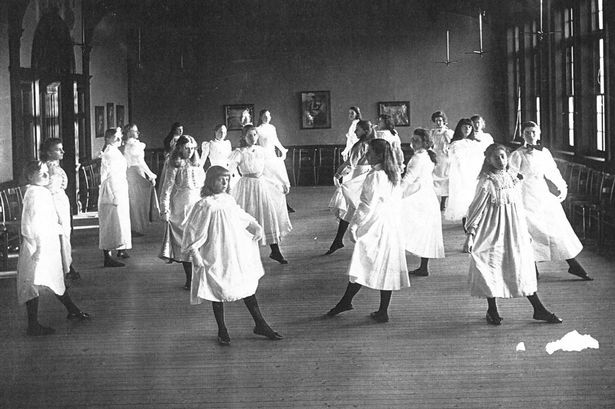 Instead of 80 girls in the School there were 120, and classes had become Forms and Form I was now little ones. The Newcastle High School on Tankerville Terrace Miss Dickinson would have known as a girl: a Form and Form Teacher c 1890 (above) and a Dancing Class in the Hall (below). The green cupboard (left of picture) the young Florence Evelyn Dickinson never could draw properly. 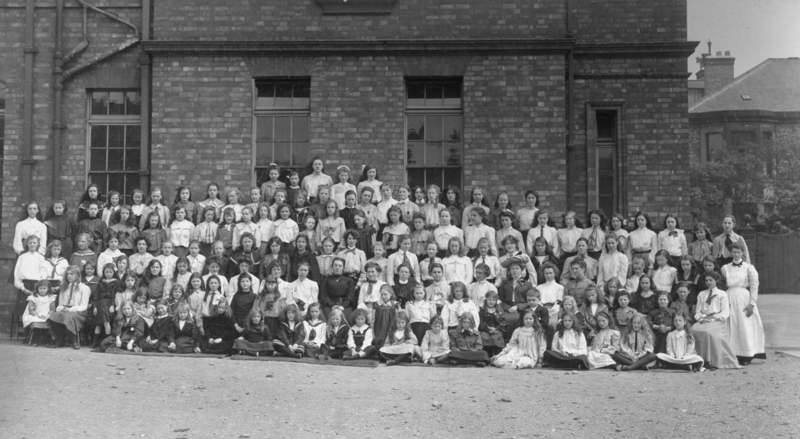 The 1905 School photograph of the whole school with Miss Gurney taken in the playground at the back of the building. The head-count, including all the staff is 135 in total. The eagle-eyed will spot one or two young boys amongst them too. 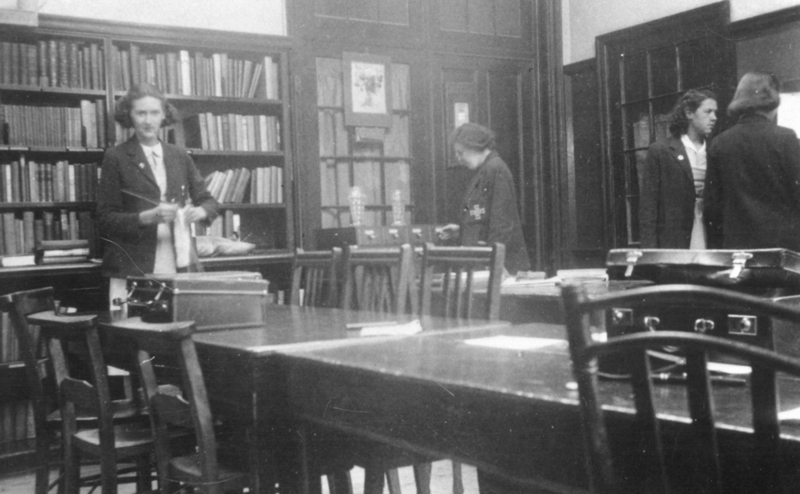 “The building was smaller [then]; there were no labs, no geography room [the 1927 extension], no dining room … [a further extension in 1935]. 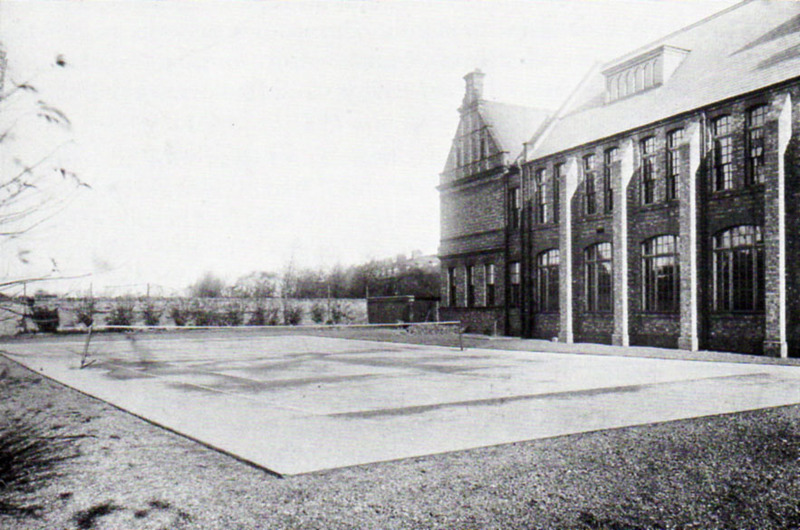 The Science Laboratory created by extending the first floor of the building over the school playground at the back in 1927 (above) and the playground as it appeared in 1900 (below). 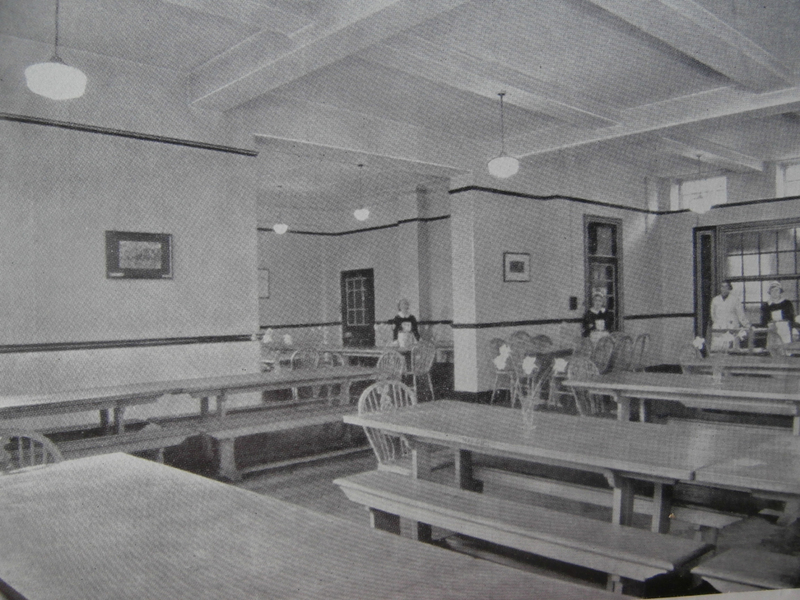 The purpose-built School Dining Hall in the 1937 extension. 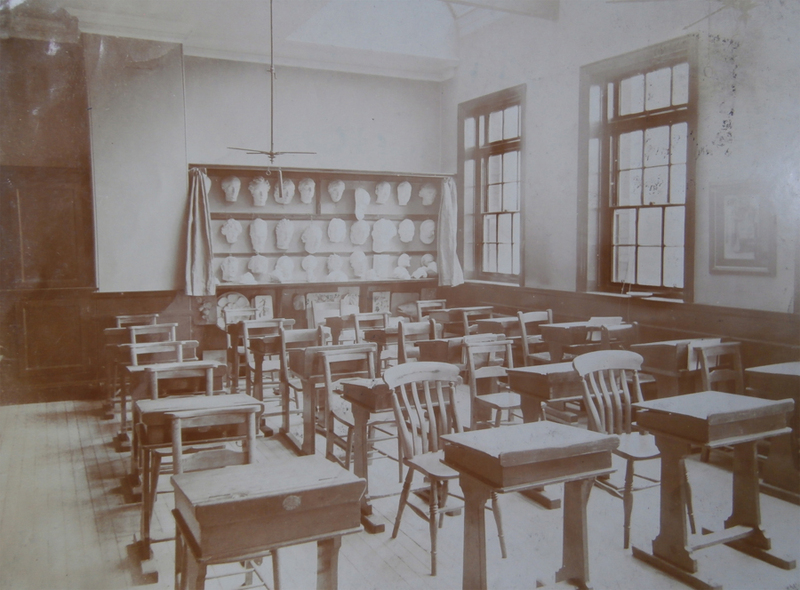 “What is now the Botany Lab was then the Art Room – a room furnished with a piano and some chairs. Drawing lessons took place there, music and singing lessons if the hall was very cold, or if the rain was coming in. All the School from Form II upwards had Drawing at the same time then. Form II stayed in its own room, Forms IIIb, IIIa and IVb were in the Hall and IVa and V in the Art Room. This was on a Thursday morning from 11.30 to 1 o’clock. The Mistresses’ Room was where it is now – downstairs – and as you came upstairs from the cloakroom [located then, as the toilets and locker rooms still were even in 2014, at the foot of the South Staircase] and went along the corridor, the rooms were in this order on your right: Form II (under Miss Miller), then Form I and the Kindergarten (under Miss Norman), then Lower IV (under Miss Ram, later Mrs Dilley), then Form III/IIIb together (my Form) [this would have been latter day Rooms 4 & 5 (my own teaching classroom), which I discovered during the restoration process were originally divided by a moveable partition wall], then Upper IV (under Miss Davenport, who was then the Second Mistress), then Form V (under Miss Siddall, the Head Mistress) and then Form VI (at that time, only two girls). 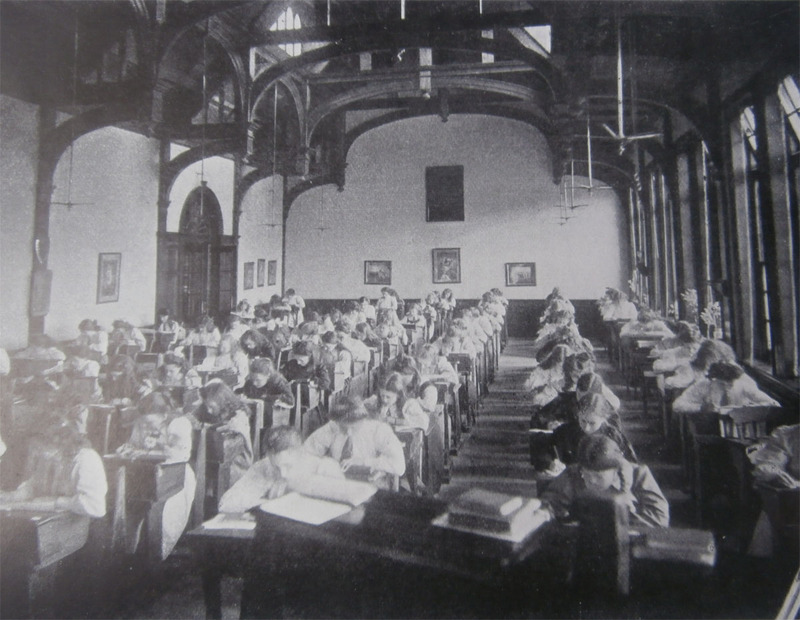 A first floor classroom towards the end of the corridor as pictured in the 1910 Newcastle High School prospectus. 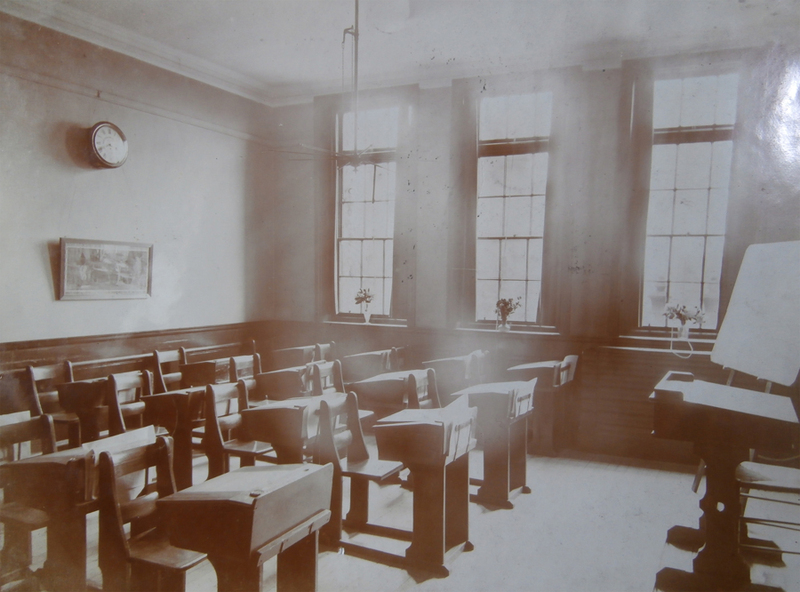 A light and airy classroom situated opposite the Hall in 1910. 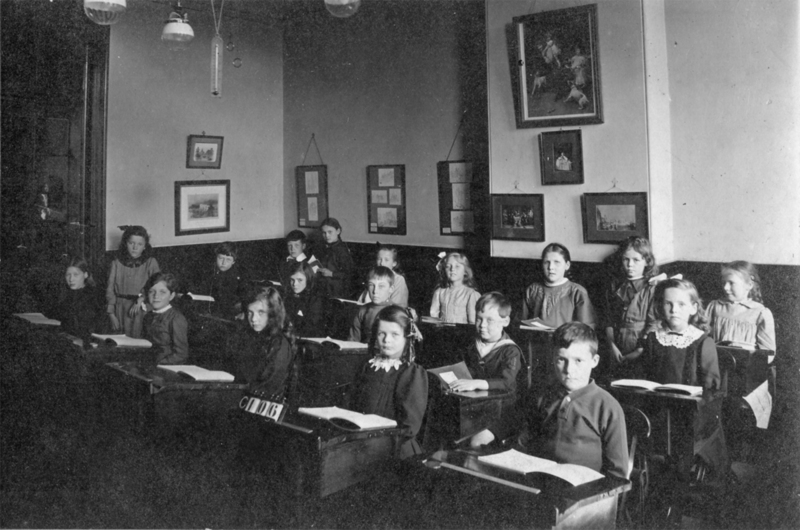 ‘Little Ones’ in the Form 1 classroom in 1914. In this image the glass-panelled doors can be clearly seen to the far left. 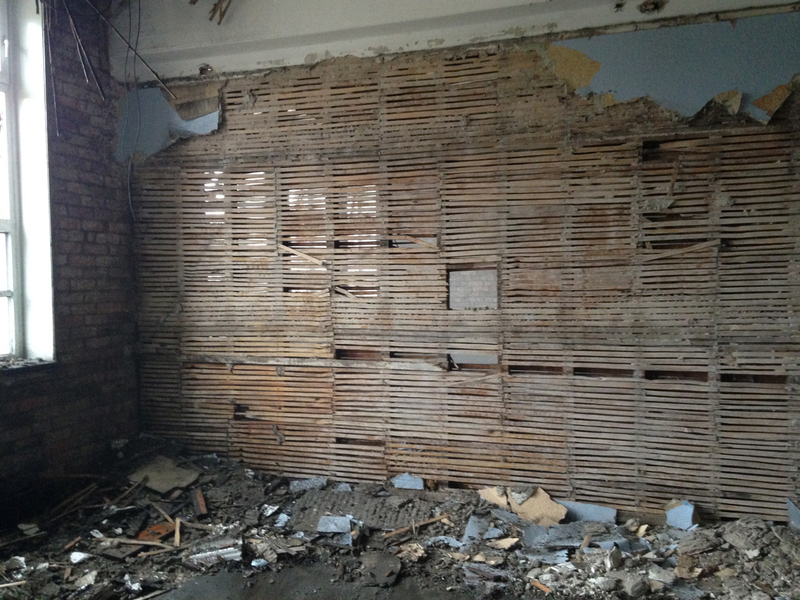 Giuseppe’s photograph of the insubstantial wooden lathing discovered between Rooms 4 & 5 at strip-out time. I always wondered why noise seemed to travel between these two rooms more than the others. 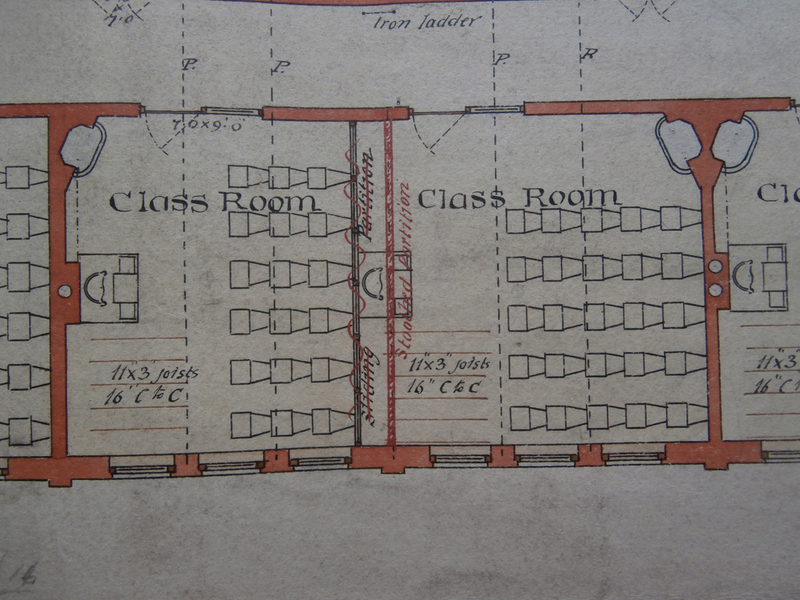 I now know that the original design had a sliding partition between these two classrooms. “On the other side of the corridor were a non-descript room where the little ones sometimes played or where an Arithmetic division was taken [in 2014 the room was still being used as a Maths classroom – Room 8] – the hall and the drawing pantry, the room I’ve told you about already. 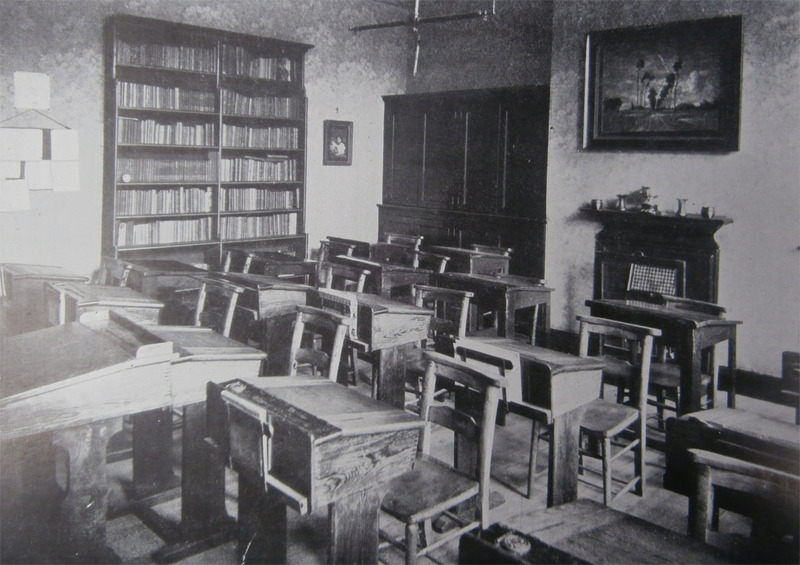 By the 1950s, the ‘non-descript room where the little ones sometimes played or where an Arithmetic division was taken’ (latterly Room 8) had become the School Library. 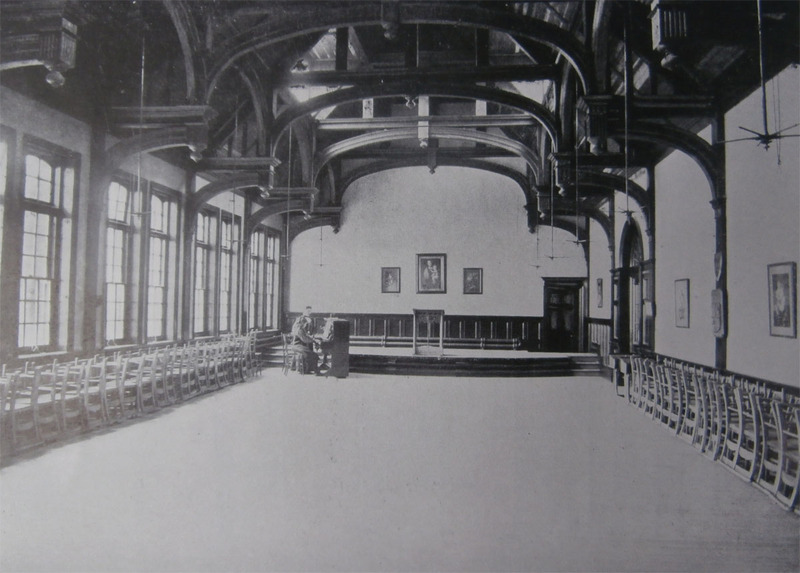 Early photos of the Hall from the 1910 School prospectus: the North end with stage (above) and at exam time (below). 1910 photo of the Drawing Pantry & its big green cupboard. “Downstairs there were no Form Rooms. 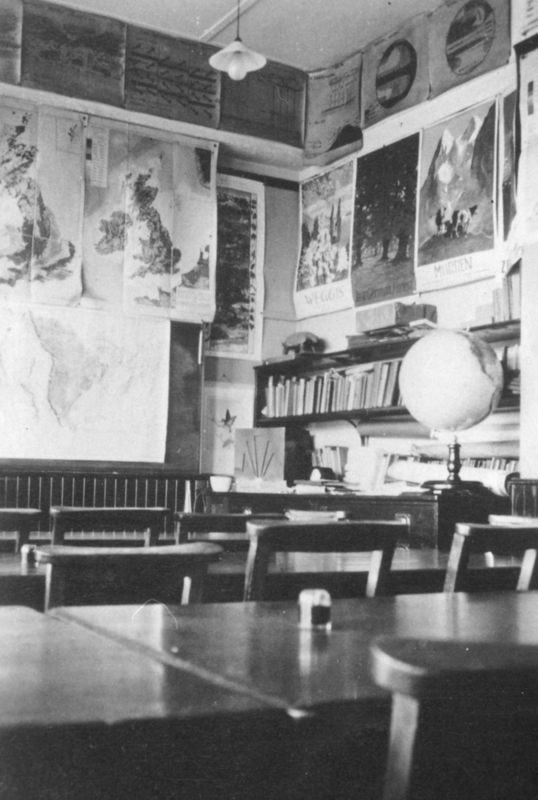 If you started at the cloakroom end, on your right there was the Staff room, the Staff Cloakroom, the library, the front door, the Head Mistress’s room, the caretaker’s rooms and the stationery cupboard, the dining room [Small Dining Room] and, on the other side, the kitchen, the gymnasium and the Junior Cloakroom. Form and Form Mistress outside the front door in 1905. 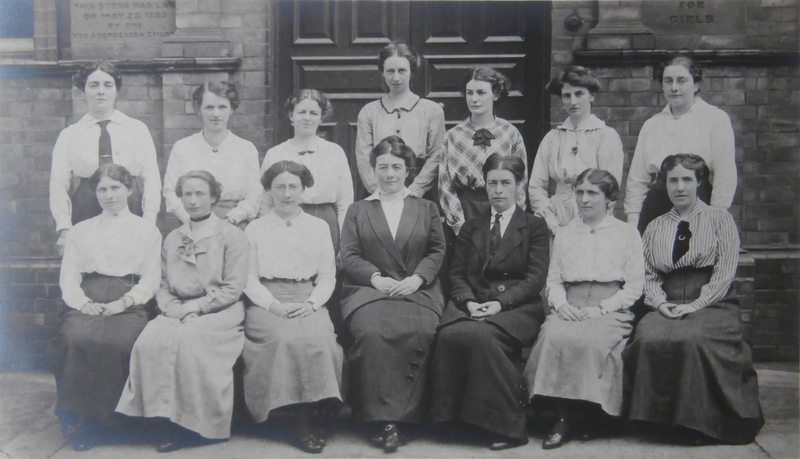 Teaching Staff photographed at the front door in 1916: Back Row, L to R Miss Lush, Miss Beddoes, Miss Cook, Miss Weddell, Miss Jewson, Miss Dodgson, Miss Johnson. 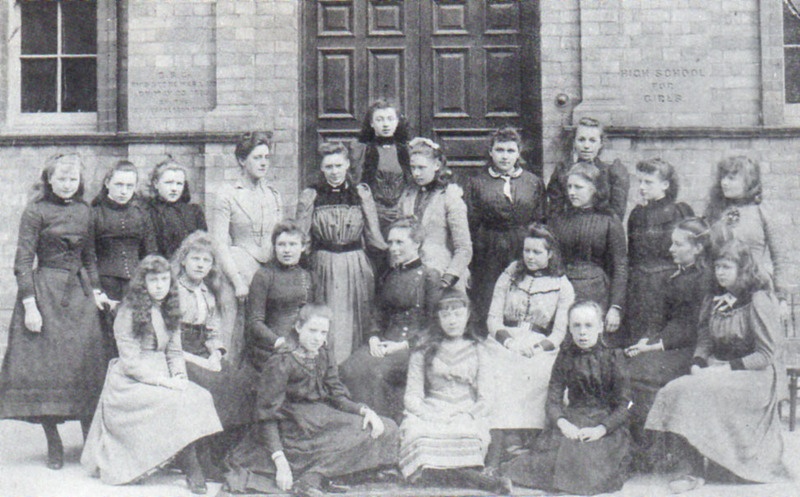 Front Row, L to R: Miss McNeil, Miss Edmonds, Miss Claridge, Miss Gurney [Head], Miss Dickinson [D.Head], Miss Kelly, Mrs Barker. 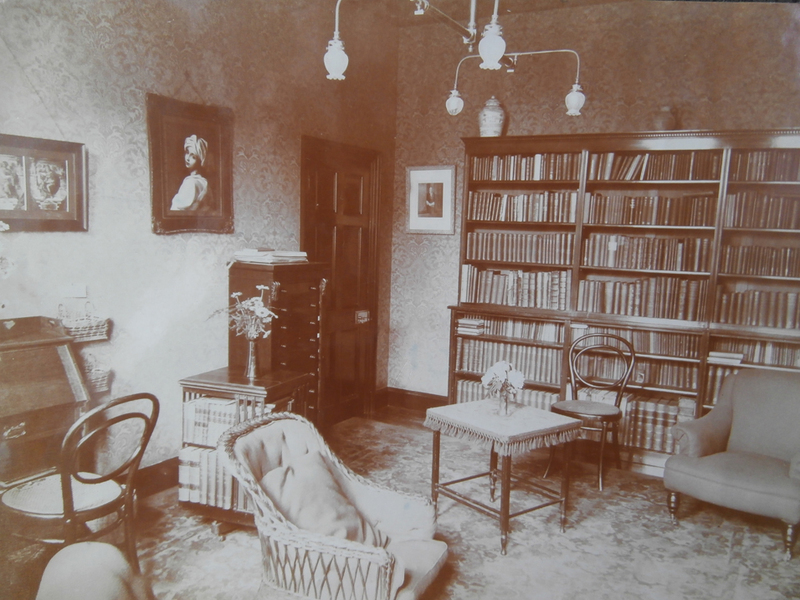 Miss Gurney’s Room (the Head Mistress’ Study) in 1910. 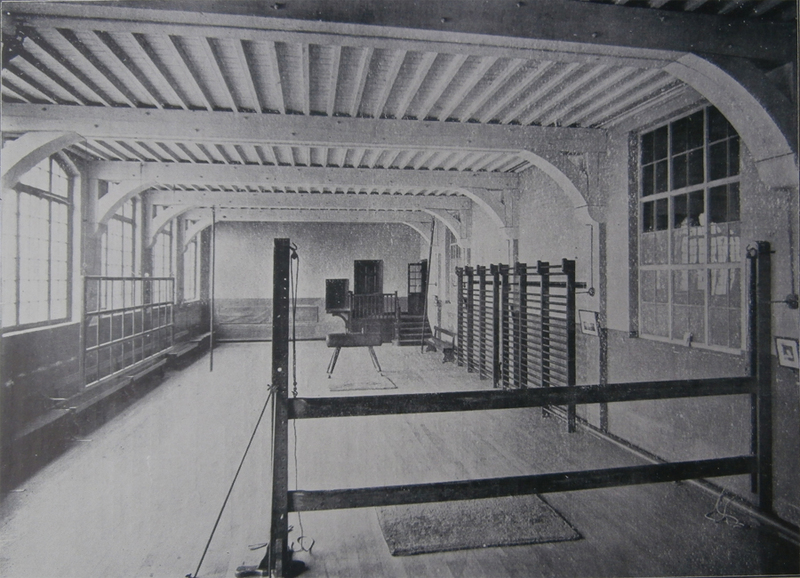 The Gymnasium as it appeared in the 1910 prospectus. 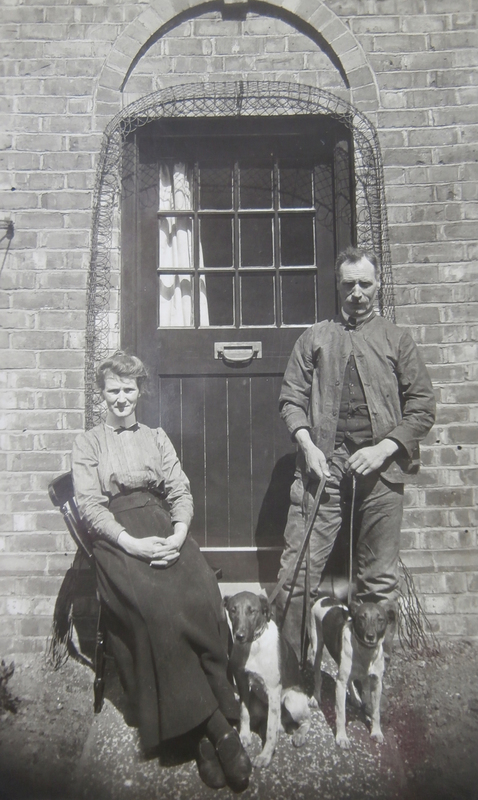 Mr and Mrs Waterman pictured outside the Caretaker’s Cottage with Jester, their brown and white terrier. 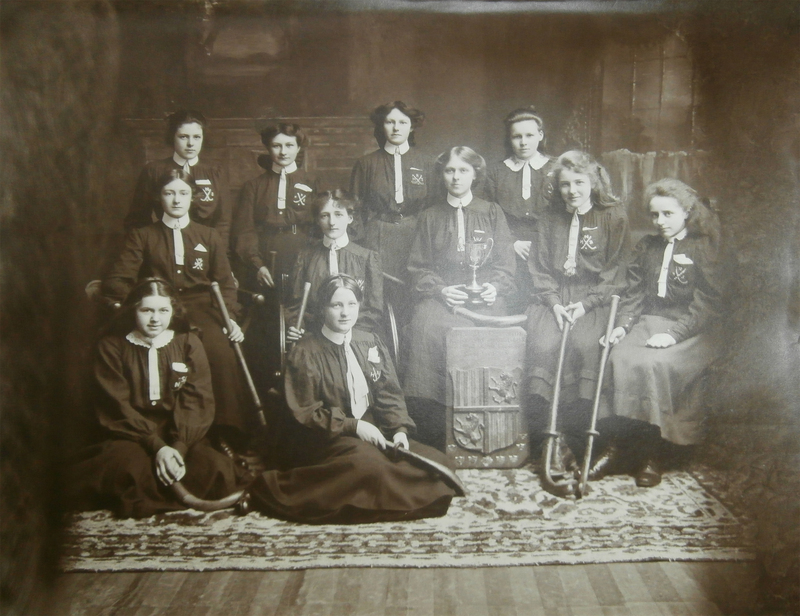 Newcastle High School’s 1909-1910 Hockey First XI. 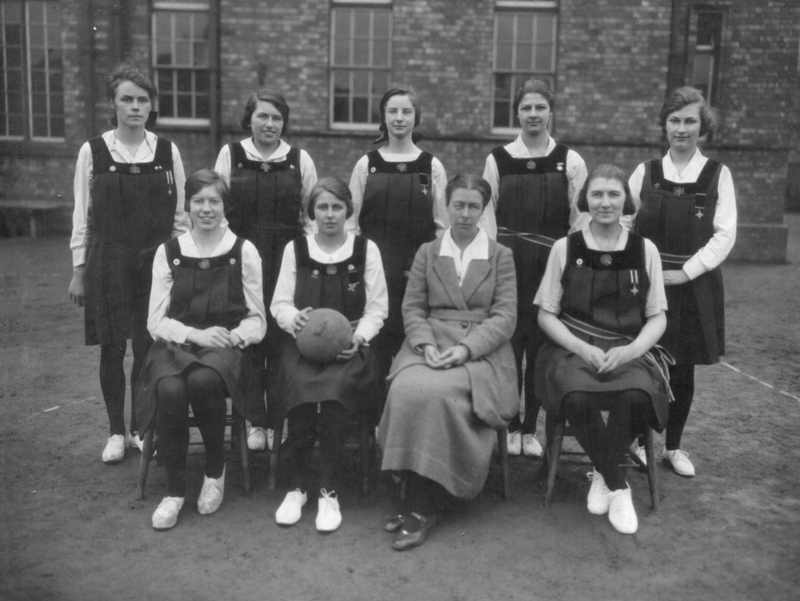 Miss Dickinson with the 1923-1924 NHS Netball Team. 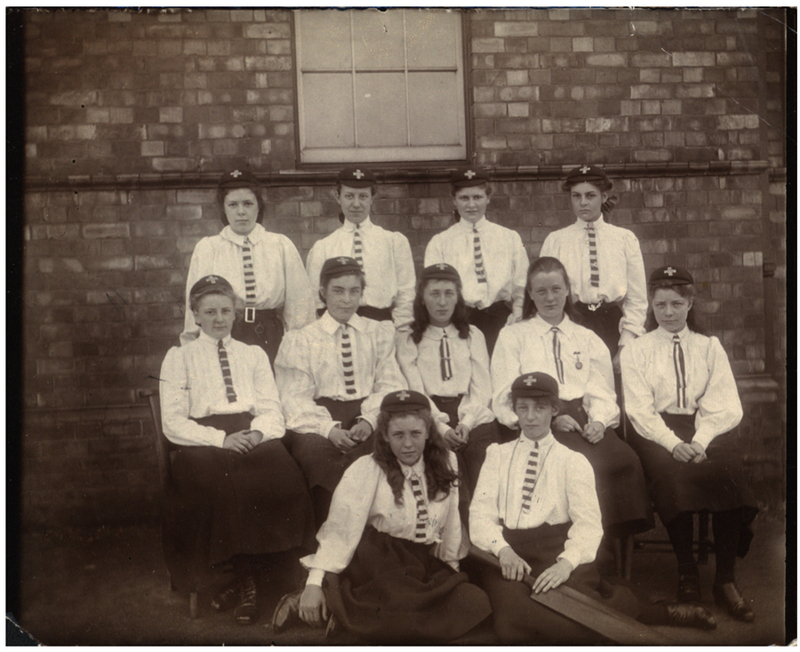 The Newcastle High School 1916-1917 Cricket First XI. “Though we had outgrown the hall for prize-givings, we had to use it in wartime, so blinds (paper ones) had to be fixed to the windows. These blew about considerably when the ventilators were opened. During one prize-giving when the chief guest was speaking, Waterman [School Caretaker at that time] came upstairs to say that two special constables had seen lights shining out of the hall windows and they must be put out. In those days, the Staff spent prize-givings in the corridor so he easily passed on the message to me. The hall was lighted by gas and each bracket had to be turned off separately. I reached the Chairman with some difficulty; he interrupted the speech and said: ‘Will the gentlemen who are sitting on the window side of the room kindly stand on their chairs and put out the lights over their heads? Thank you,’ and the rest of the prize-giving went on in a room which had ‘L’air borgne.’ (Look it up.) [So typical of a Modern Languages teacher to say this, even though, in her time, Miss Dickinson also turned her hand to the teaching of Scripture, History, all English subjects, Mathematics, Singing, Violin and Gymnastics, in addition to coaching Hockey and Netball as well as organising girls’ Swimming. The sign of a true polymath]. 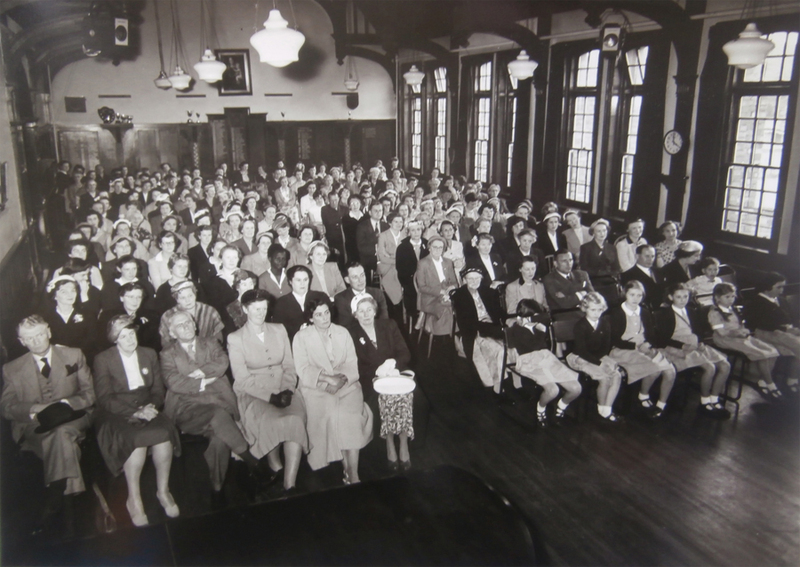 Although these images of the Hall date from the 1950s when a Bazar (amongst other fundraising activities) was held to raise funds to add an extra storey to the 1937 extension to create a Library, they give a good idea of the eventful wartime prize-giving Miss Dickinson recalls in her remembrances. 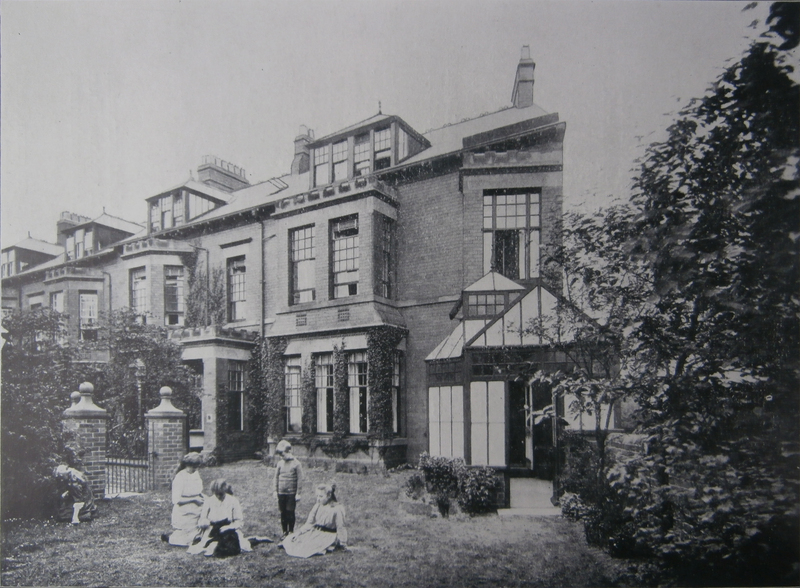 “By this time, we had acquired another building – the Junior School and the laboratory were at 5, Henshelwood Terrace [bought by the Governors in 1917. From 1913, Miss Gurney had leased the house as her own home, living there with her sister Nellie. As she did at 16, Otterburn Terrace, Miss Gurney received boarders within her home at Henshelwood too and it was for this address that the first School House Prospectus was produced]. One day the fume cupboard took fire and we had the excitement of having a fire engine at the gates and firemen all over the building. Fortunately, the fire was soon put out. 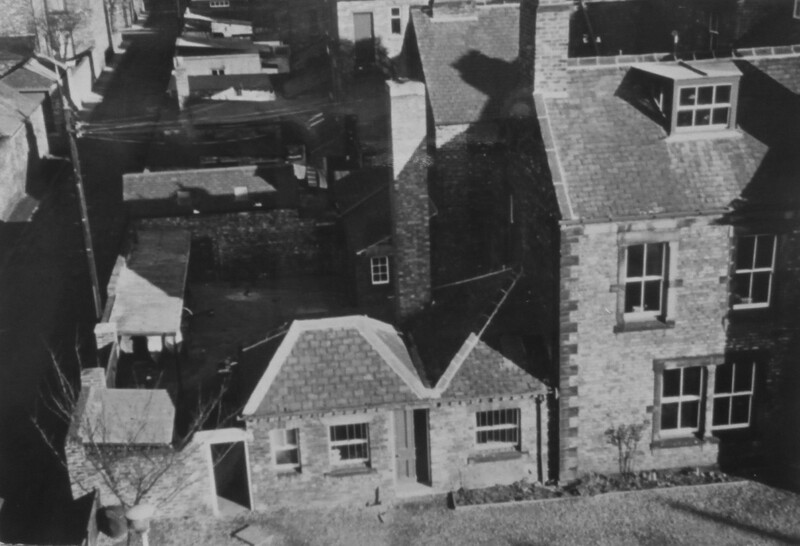 5, Henshelwood Terrace when it served as the Junior School. 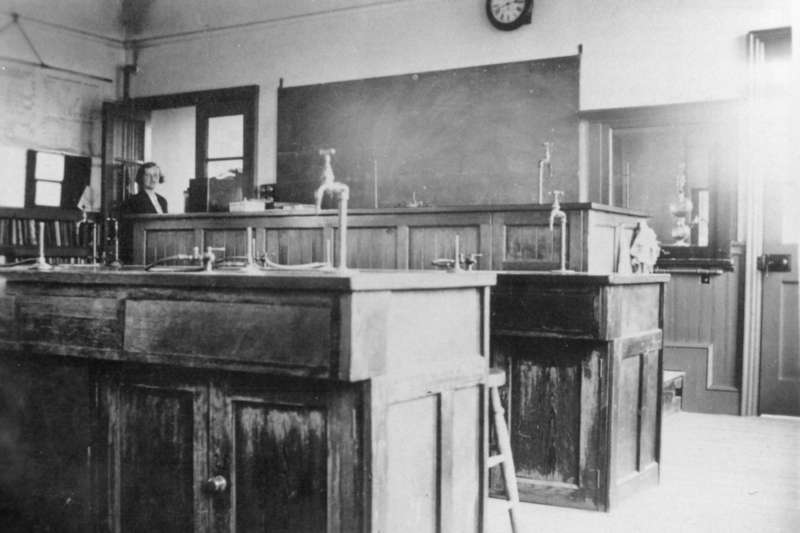 “The next improvement was having a Lab on the premises ….. [created in 1927 by extending the back of the building out over the playground on pillars; some of the space below it became a Geography room]. 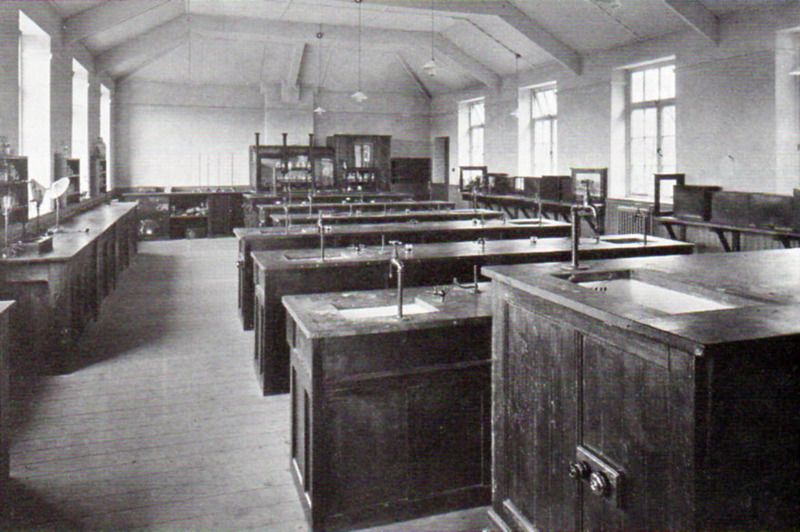 The 1927 rear extension to School: initially, the Science Laboratory was built on top of columns, but later the spaces between them were filled in to create a Geography classroom. The Science Lab (above) and the Geography room (below). 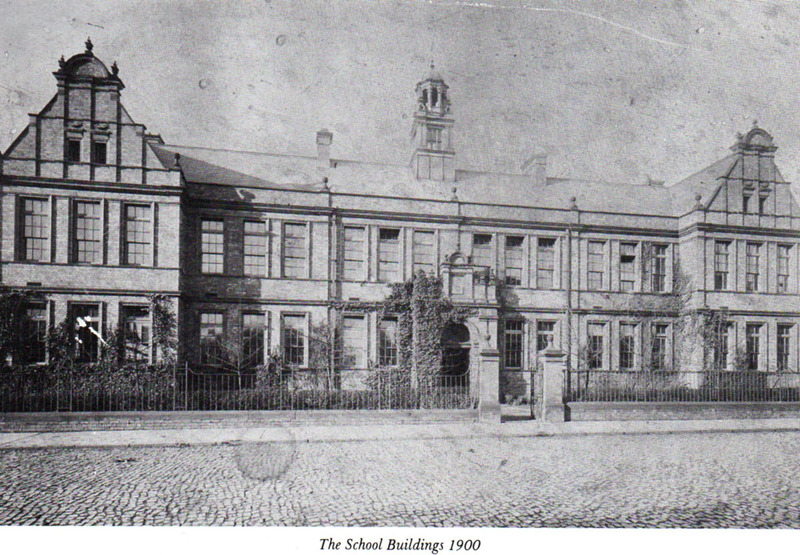 Tankerville House, bought to serve as a Junior School, would eventually become the Church High Sixth Form Block. 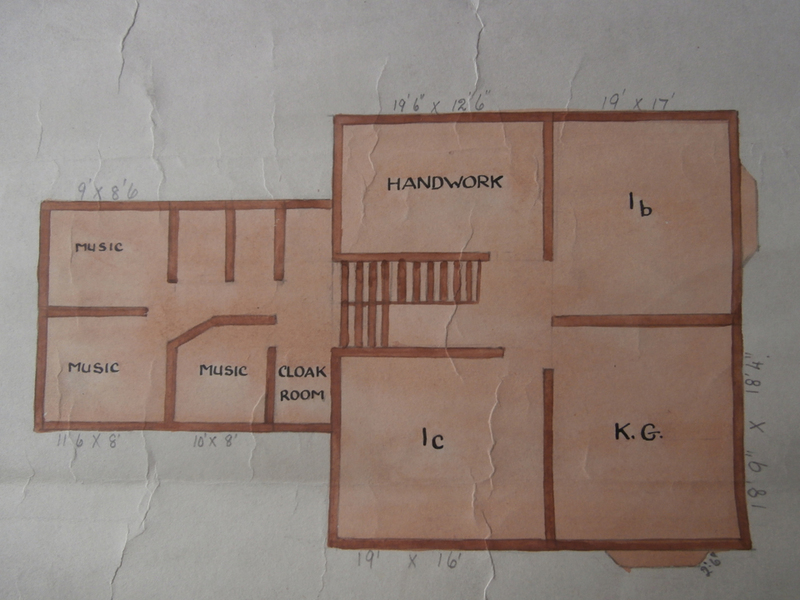 Architect’s plan of the Tankerville House First Floor showing the position of the music rooms (above, left). A large area of the Top Floor was an ideal space for an Art Studio (below). Miss Dickinson photographed on her retirement. 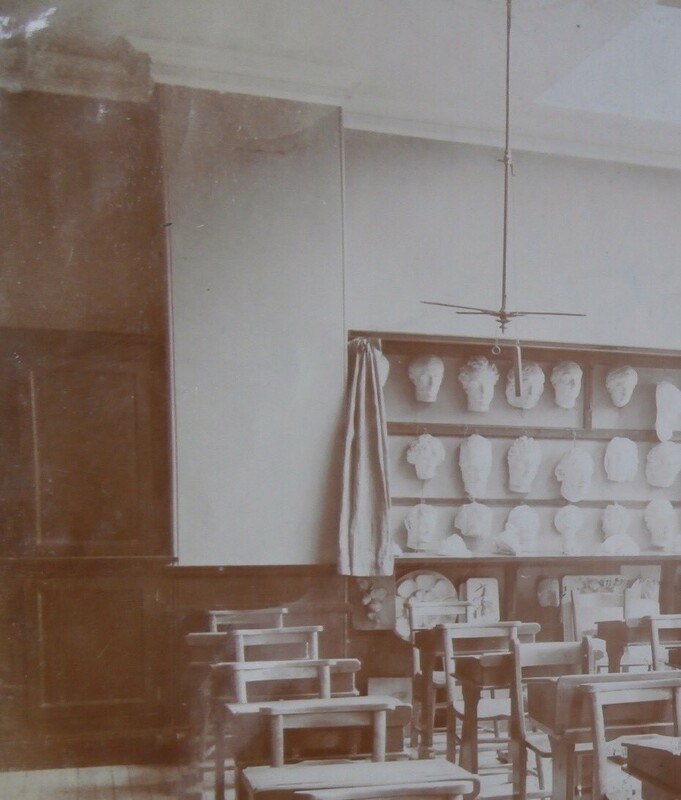 It speaks volumes that the above framed image of Miss Dickinson is the only photograph of a Second Mistress/Deputy Head in the Church High archive, either at School or at The Discovery Museum. 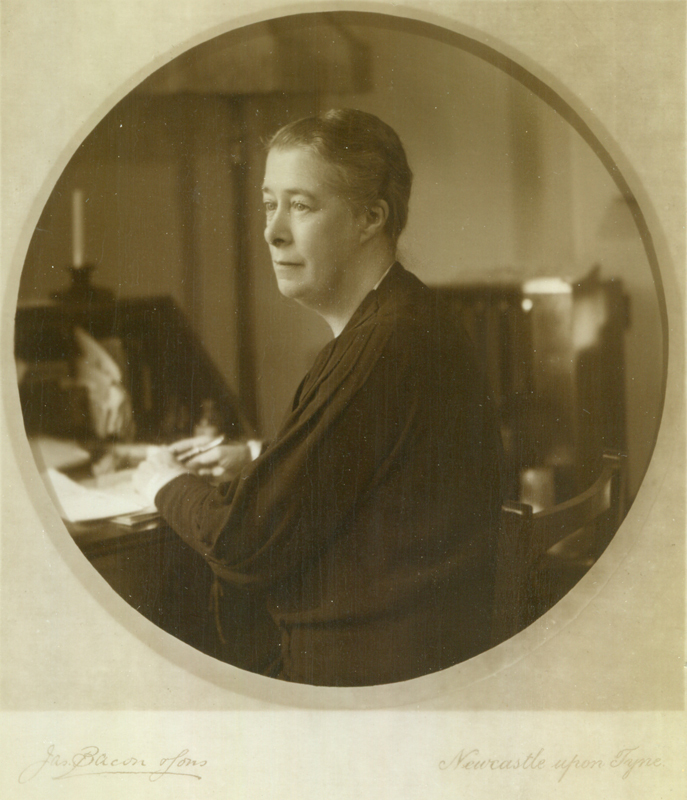 Her time spent at Jesmond Road and Tankerville Terrace as pupil, teacher and Second Mistress undoubtedly makes her one of the School’s longest standing servants. 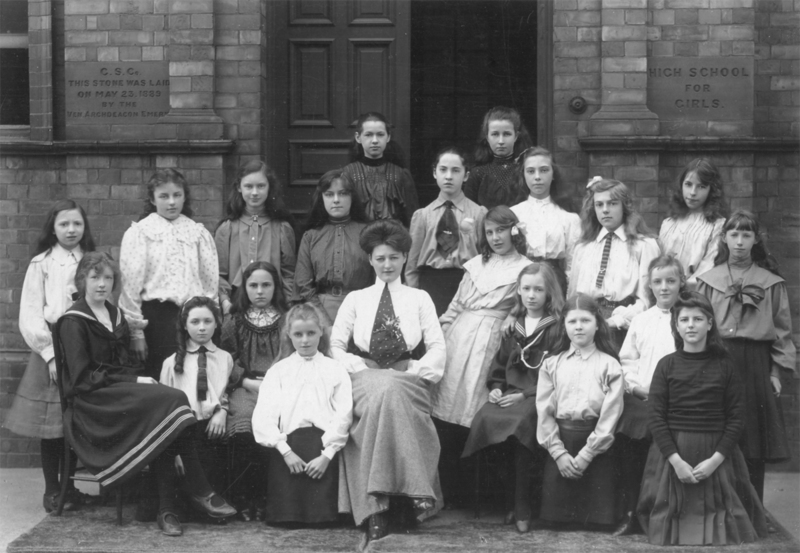 Thanks to the 1905 whole school photograph, we are able to compare the graceful, poised figure seated at her desk above with the young Miss Dickinson. 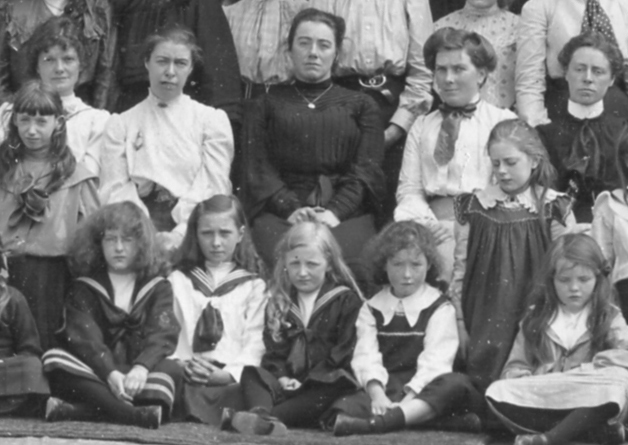 Close-up detail of the 1905 School photograph showing Miss Dickinson (in the white blouse) on Miss Gurney’s right. But what of that young girl called Florence who, accompanied by her two sisters, ‘tried three other doors, all of which looked like front doors, before they found the right one’ on her way to Newcastle High School for the very first time and witnessed the foundation stone of the new School being laid ‘in a place rather a long way off anywhere called Tankerville Terrace’? The likelihood of a photograph existing of her are, admittedly, very slim indeed. But there is just a chance that we have one. 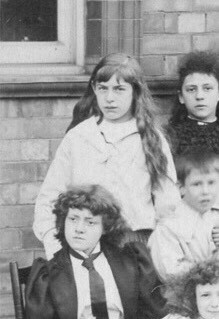 For looking even closer still at that Elliott & Fry image of the younger children which seemed older than the others, to the left of the group, a serious-looking young girl with long blonde hair wearing a pristine white blouse caught my eye. There is no way I can be sure of this, of course, but the dates do match. How wonderful would it be if this was indeed the young Florence Evelyn Dickinson? Florence Evelyn Dickinson as a young girl?